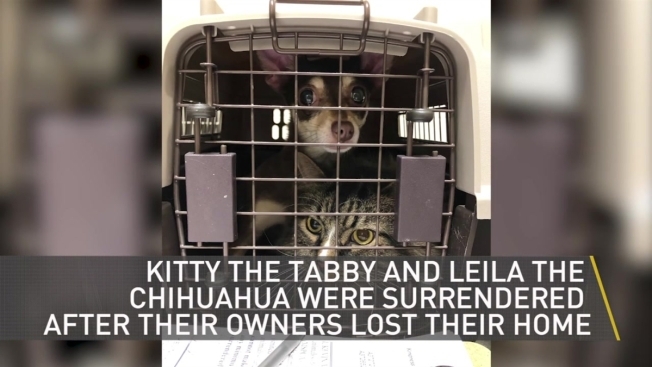 Kitty and Leila, an inseparable cat and dog duo surrendered to a Boston animal shelter, have been adopted together, assuring that this odd couple will remain close fur-ever. Leila, a 2-year-old Chihuahua, has known Kitty, a 6-year-old long-haired brown and white tabby cat, all her life. When their previous owner lost their home and couldn’t find a find a new place that would accommodate the pets, the pair was surrendered to the Jamaica Plain animal shelter. The MSPCA-Angell said Kitty and Leila were dropped off sharing the same carrier. "They are each other’s best friend and keeping them together has made a very difficult situation much easier for them to handle," said Anna Rafferty-Fore, associate director of the MSPCA’s Boston adoption center. Determined to keep the best friends together, the shelter even broke its own protocol of housing pets with their respective species. Kitty and Leila shared makeshift quarters in a room apportioned just for them, the shelter said. The MSPCA also hoped to find the duo new pet parents willing to take both Kitty and Leila. They shared their story on social media, and pleaded with users to help them find "a hero individual or family to adopt them both, so the two confidants need never, ever be separated." A week later, their wish was granted. A Massachusetts couple who came across the story of Kitty and Leila was more than happy to take in the two best friends. When Moki the pit bull was adopted, she was instantly obsessed with the guinea pig cage in her new house. Their mom decided to introduce them — but the guinea pigs were not into it at first. Moki persisted with all her "pittie" affection until the little piggies loved her right back. The MSPCA tweeted a picture of the new family and thanked everyone for sharing their post and spreading the word to help find a home for the inseparable cat and dog duo.